The boy emerged from the undergrowth. He crossed the dirt track to where a rusty metal sign swung squeakily above his head. The ancient, chipped writing read ‘Kruger Diamond Mine, established 1897’. He waited by the gate as he had been instructed. The boy was slightly built and underweight, his dark, dirty, hooded jacket hanging off his shoulders. He thought about his family, at home, waiting anxiously for him to return with enough money to feed them for at least one more week. As he waited in the darkness, Jonas also thought of his father and how much he missed him. 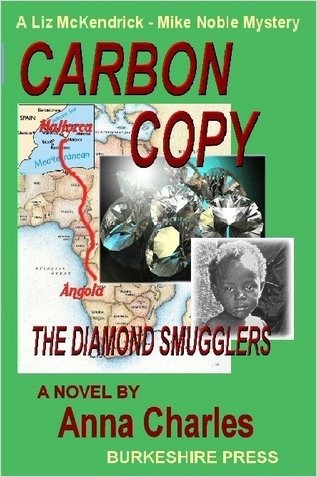 He had been a garimpeiro – an illegal diamond miner, toiling in the river bed, clawing out stones with his bare hands, under the watchful eyes of the Unita guards. It was hard labour, for meagre wages, and one day he decided he’d had enough and didn’t turn up for work. The soldiers had come to the village, dragged Jonas’ father from his hut and tortured him. His mutilated body had been discovered the next morning, tied to a tree. It was meant as a warning to others who might consider leaving. Since then Jonas had watched his mother, Martha, struggling to find food and water for her family, often reduced to begging for scraps of food on the edge of the nearest town. Now all that would change. The man had promised money in return for delivering a small package. Jonas would have to scramble for several miles along the inside of a sewerage pipe leading from outside the mine, until eventually he emerged by the side of the Cunena River, where another man would take the package from him, in return for the precious coins that he could take home. It had been a long time since Jonas had seen a smile on his mother’s beautiful face; most of the time it was ravaged with worry and grief. Whatever hardship he had to endure once he was in the pipe, he knew it would be worth it if he could see his mother smile again. Suddenly he heard footsteps. The gate creaked open and a man came towards him. 'Boy!’ the man whispered, urgently, looking down into the big brown eyes of the ten-year-old boy, staring back at him. ‘This is a very important job I have for you tonight.’ He held out a greasy looking roll of waxed fabric. ‘Put this safely in your pocket and zip it up. Do not take it out until you meet the man at the end of the pipe. He will take it off you and give you money in return. He looked down at the boy’s bare feet, the black skin caked in mud after his walk from the village. Good, he thought, shoes would be no use in the pipe and would only hamper the boy’s progress. He reached into his trouser pocket and pulled out a piece of material, handing it to the boy. Jonas slipped the hood off and tied the material as he had been told. Then he pulled the hood back over his black crinkly hair. ‘Good, now you are ready for your most important journey,’ said the man, quietly leading him over the grass verge and down into a gulley. Poor little sod, he thought as he raised the manhole cover and helped the small, black figure climb down into the sewer, knowing the size of the pipe was barely large enough to accommodate even a child. Closing the manhole cover, he thought fleetingly about the last child he’d put in this pipe. He remembered that the child had not returned to his village. However, the precious package had reached its destination safely, which was all that mattered. The rest was nothing to do with him. Locking the gate behind him the man returned to his office. The night shift would be arriving soon. Once the manhole cover closed over his head, Jonas looked around him as his eyes began to grow accustomed to the dark. The small torch was totally inadequate, casting only a slight shadow on the pipe, but at least it served as reassurance. The foul smell hit him at once and he did as the man had told him and pulled the neckerchief over his mouth and nose. He felt the slimy, putrid water under his feet as he slipped and squelched his way slowly along the shallow gulley, his eyes smarting from the strong smell of ammonia. Jonas picked his way along the pipe, his head touching the top, his fingers feeling the way along the sides as he slithered and slipped, making slow, but careful progress. He lost all track of time but knew he had been travelling a long way as his legs were getting very tired. He again thought about the food his mother could buy with the money he earned tonight, and that kept his spirits up. He imagined what it would be like for him and his siblings to have their bellies full. The thought of food made him lose his concentration momentarily and he felt his feet slipping from under him. At the same time he let go of the torch and, although he spent several minutes groping around in the foul water, he couldn’t find it. There was nothing for it but to continue the journey in complete darkness, his hands touching the pipe at either side to steady himself. He thought about the precious package. Stopping for a moment to rest, he patted his side and felt the reassuring bulkiness. Do not touch the packet until you reach the other end, the man had told him. Jonas quickly put his hand back onto the pipe and moved off again. As the hours passed, his legs became heavier and heavier. He rubbed his sore eyes with the back of his hand. He stopped again and lowered his arms. Surely it couldn’t be much further, he thought. Would he ever reach the end? He was about to give up hope when he saw a light ahead. Or am I imagining it? he thought. No, there it was again, a small, flickering light. He quickened his step and suddenly the air became fresher. He could actually feel a draught on his face. A hand and arm reached down to haul him out of the pipe and above him a white face was smiling down at him. ‘Good boy,’ the man was saying as he pushed the hood away from Jonas’ head and the neckerchief away from his mouth, offering him a bottle of water. The boy gulped the clean, clear liquid down and felt the man patting his pocket. ‘Give me the package,’ he said gruffly. Jonas unzipped his pocket and withdrew the roll. Despite the foul-smelling dampness of his fleecy jacket, the waxed material had protected the contents of the package from harm. He handed it to the man who stuffed it into the inside pocket of his coat with barely a glance. Putting his hand into his trouser pocket, he took out a few coins and handed them to the boy. ‘That’s for a job well done,’ he said as the boy inspected the coins in his hand. ‘Thank you, sir,’ he replied gratefully, turning back towards the pipe. The boy’s heart sank. Although he did not know the way back, he knew it would be a dangerous journey. He’d heard of the wild animals in the scrubland, not to mention the snakes. He looked down at his bare feet in despair.